When victims are involved in motorcycle accidents, they can pursue a damage claim to try to obtain compensation from the driver who hurt them. 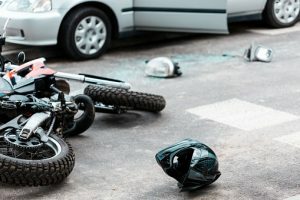 In some cases, drivers try to argue they should not be fully responsible for all injuries and losses which because the motorcycle rider was not wearing a helmet. The reality, however, is the law does not require helmet use for most motorcycles in Florida- and the use of a helmet should not matter to a jury or during settlement negotiations. Despite the fact a driver should still be forced to fully pay for losses when he causes a motorcycle accident, regardless of helmet use, there is sometimes concern that juries can be biased when a motorcycle rider is not wearing a helmet at the time of the crash. Victims may need to overcome this by making it clear that helmet use is not a factor. A new article from Florida Today reveals helmet use may not be a big factor at all in terms of whether someone is killed in a motorcycle accident. Under Florida law, a motorcycle rider is not obliged to wear a helmet while riding as long as the driver is at least 21 years of age or older, and as long as the driver has medical insurance coverage totaling $10,000 or greater. This has been the rule since 2000. Research shows these helmet laws and the subsequent decision of many drivers not to wear helmets under certain circumstances, have not caused an increase in fatalities. In 2013, for example, nine of 14 motorcyclists killed in Brevard County, Florida were wearing helmets at the time of the fatal accident. In 2014, three of five motorcyclists who died had helmets at the time of the incident. In Volusia, Seminole, Brevard, Orange, Lake, and Osceola counties, there were 57 deaths in 2013, and the motorcyclist was wearing a helmet in 32 of the fatal accidents. In 2014, there were 50 deaths, including 23 with motorcyclists wearing a helmet. Finally, in 2016, there were 62 deaths and 31 of the people who died had helmets on. A Public Affairs Officer for the Florida Highway Patrol indicated wearing a helmet may not make much of a difference in terms of causing fatalities because "a lot of crashes are unsurvivable because of the nature of the crash. The victims of these serious accidents would be killed by the force and nature of the impact, even if they had a helmet on at the time." The families of the victims should thus be fully compensated if the impact occurred due to the negligence of another driver, no matter what the helmet status of the motorcycle rider was.